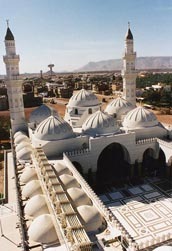 To visit Madinah is not a Hajj or Umrah rite, but the unique merits of the Prophet’s city, his Mosque and his sacred tomb attract every pilgrim to visit it. There is no Ihram nor talbiyah for the visit to Madinah or the Prophet’s Mosque. During this journey, recite Darud Sharif frequently. When the city of Madinah is in sight, show your extreme fondness and excitement and humbly enter the city while reciting Darud and Salam. 2. Masjid-e-Nabvi. After putting your luggage at your residence, take a bath or perform ablutions (vudu), wear nice dress, apply perfume and proceed towards the Prophet’s Mosque while uttering Darud. 3. Bab-e-Jibril. Enter the mosque through Bab-e-Jibril or Bab-us-Salaam or if this is not possible, enter through any other door. 5. Two Raka’t Nafl. If it is not undesirable (Makrooh) time, offer two rakahs of nafl tahiyyat al-masjid (greeting of the masjid) preferably in Riaz al-Jannah near the tomb of the Prophet or otherwise anywhere else in the mosque. 6. In front of the Holy Tomb. 8. In front of the sacred tomb of The Holy Prophet (peace be upon him), there are three sections of brass screens and all three have holes in them. Look at the picture carefully. If you stand in front of the middle section between the pillars, you'll see a big round hole on your left. This is in front of the face of the Holy Prophet. Adjacent to it is a door that stays closed. Right after it on the right side is a round hole which is in front of the face of Hadrat Abu Bakr Siddique. 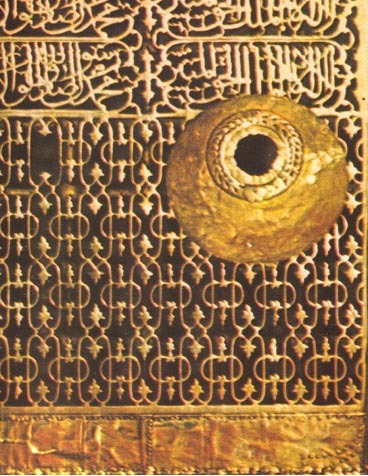 On the right of it, there is another round hole which is in front of the face of Hadrat Umar Farooq. "Assalatu was-salamu alaika ya Rasul-Allah"
"Assalatu was-salamu alaika ya Nabi-yallah"
"Assalatu was-salamu alaika ya Habib-Allah"
"Rabbana atina fid-dunya hasanatan wa fil-akhirati hasanatan wa qina azabin nar." "Asslamu alaika ya Rasul Allah min----." 10. Salam on Hazrat Abu Bakr Siddique. Then move a little to the right and stand before the grave of Hazrat Abu Bakr (may Allah be pleased with him). Greet him and supplicate to bestow His mercy and forgiveness on him. 11. Salam on Hazrat Umar Farooq. Again move a little to the right before the grave of Hazrat Umar ( may Allah be pleased with him), and greet him and make supplication for him. 12. Forty Prayers. Men should offer forty prayers (Salat) in the Prophet's Mosque, but it is not a requirement of any kind. It is only Mustahab, i.e., rewarding if done, but if not done there is no sin. martyrs of Uhud (may Allah be pleased with them) and Masjid Qiblatain, etc. Among them Masjid Quba is the most important. It is the first mosque in the history of Islam whose foundation stone was laid down by Prophet Muhammad (peace be upon him) himself on his migration to Madinah. To offer 2 raka'ats of nafl in it is equal to one Umrah. After visiting the Prophet’s Mosque and his tomb every pilgrim should try his best to visit it and pray in this mosque as well. 14. Departure from Madinah. When you have to leave Madinah, offer your Salam again to the Prophet (peace be upon him), cry at this separation, supplicate to Allah and leave with the earnest desire to come back.